Meet Errol, a stubborn red-beanie-wearing penguin. When Errol’s mum calls for him to follow her, he doesn’t listen. Instead, he goes and gets himself covered in the falling snow. While his distraught mum is left behind with a lone red beanie to despair over, Errol is busy underground having a totally awesome adventure. His cavalier attitude on his return (‘Come Mum’) is forgiven immediately by his relieved, presumably long-suffering parent. Valdemar hates peas but his dad says he must eat them all before he can have dessert. Luckily, Valdemar’s little sister Lin loves peas and it’s not long before he has a brilliant idea. On presenting his empty plate to his father, along with a confession that the peas are in a different small wolf’s tummy, his lovingly exasperated dad gives him dessert anyway. Thank goodness because Valdemar loves chocolate icecream. 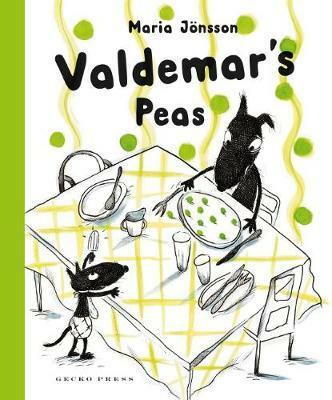 Valdemar’s Peas is a great book for showing kids that you can be honest about your naughty behaviour. In some ways, this classic doesn’t quite belong on this list. After all, the titular bad baby does learn his lesson by the end, but I felt compelled to include it because it’s so much fun to read aloud and frankly, this bad baby is very bad. He even gets to enjoy a large number of treats throughout his rumbustious elephant ride (‘rumpeta, rumpeta, rumpeta down the road’) before he’s eventually made to say please. And in the end, he eats some pancakes and simply goes to sleep. A mother and her six children go on a shopping excursion at the fresh food markets. With such tempting smells and delights on offer, some mischief is inevitable. As one of six children myself, I found this warm and exuberant family story very relatable, though I wonder if it would give my mother cold chills. This cheeky story is almost entirely depicted through images. A zookeeper makes his nightly rounds, bidding good night to the animals, but he doesn’t realise that Gorilla has procured his keys and is unlocking each animal’s cage along the way. A jumbled procession follows the zookeeper back to his home where his wife finally notices what’s happened. She returns all the animals to their own beds – or does she? Kids will love seeing who gets the last laugh in this bedtime romp. This is a messy, riotous, rhyming book about mealtime etiquette that is sure to be a hit at story time. Neil Goddard’s very funny descriptions of what not to do at the table – ‘Hide spaghetti in your hair / Keep crisps in your underwear’ – are perfectly matched by Nick Sharratt’s eye-catching illustrations. Princess Smartypants might be a rich princess, but she doesn’t want to do what’s expected of her and get married. When she’s commanded by her parents to find herself a husband, she slyly sets up difficult tasks for her suitors and watches on gleefully as they fail, sometimes spectacularly. That is until Prince Swashbuckle appears and smugly completes every single task. Don’t worry though – Princess Smartypants still has one more trick up her sleeves to get what she wants. Wild is a beautiful and enchanting picture book with sparse text and expressive illustrations from Hawaiian artist Emily Hughes. In its pages we meet a little girl who was raised in nature and is gloriously wild as a result. When other humans come across her, they ensnare her and try to force her to assimilate into their world, but they’re ultimately thwarted when she escapes back into her gorgeous, wild home. It’s true, this book is disgusting. Originally published in French, it has a morbid sense of humour that will appeal to a range of kids, and adults too. The cute illustrations are paired with simple repetitive text and depict some icky behaviour – starting with mild everyday actions (such as cutting your fingernails at the table) and then escalating into the truly gross (such as sticking your finger in a cat’s behind). Yep, disgusting. Lovable family dog NoMax is known as a big helper in his family, or so he thinks… Told from his perspective, this story details exactly what kind of ‘help’ he likes to perform such as fluff up the pillows with his teeth, and thoroughly clean the plates. Children and adults will enjoy the way the bright illustrations show a different perspective to Max’s. They may even start to suspect that this unsuspecting dog’s name isn’t even NoMax after all.